The next topic I wanted to cover is something that I think a tethering product like the CamRanger should really be able to help with and that topic is Focus Stacks. Just as a brief description, these stacks essentially take many images (2 -over one hundred) with a shallow DOF and treats them as cross sections (the part that is in sharp focus here) of a subject and layers them on top of one another to create a final image with a much larger DOF but usually at a macro level. It can also be used for non-macro but there are less opportunities for it there. For this, CamRanger allows you to take multiple shots at different focal points to be used to create this stack. Click to Enlarge to get a better view of the small slivers of focal sharpness. As with HDR, this function worked well. You select the number of shots you want to take and the level of focal shift (small, medium or large changes in focus) and the rest is done automatically. Unlike earlier, my macro lens had no problems with the focal shifts. The one thing to keep in mind with this though is that the camera isn’t moving, only the focal point does. This is an important distinction since it means there is a change in the geometric proportions of each image as that focus shifts. Whereas if the camera was the thing moving, the proportions would stay the same and they would be true cross sections. This is the combined image. 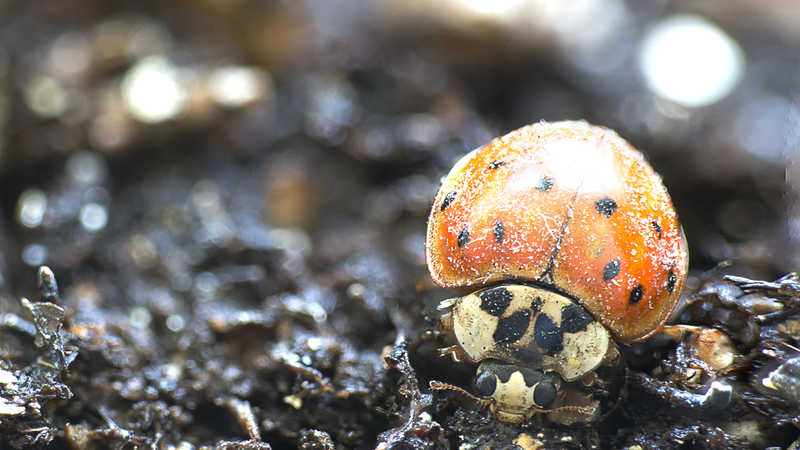 The ladybug has sharpness throughout while the background maintains the nice soft bokeh. As a result, when you stack these, you will need to use the remove geometric distortion feature to line everything up correctly. I imagine there must me a limit to the number of images than can be corrected before it no longer looks correct. I used it on a 4 picture stack and it worked just fine. Ideally, you would want the camera on a rail that lets you move the whole camera assembly in small increments to correct for this. There is a motorized rail available from Cognisys called Stackshot that will do this automatically but I have not tried it out as it is a little expensive for me at this time ($550) and I don’t have much use for it at the moment. Or you could get a cheap manual one from Amazon for around $20. Next time, I will discuss my experience taking a night shots with the CamRanger. Just reading your review. 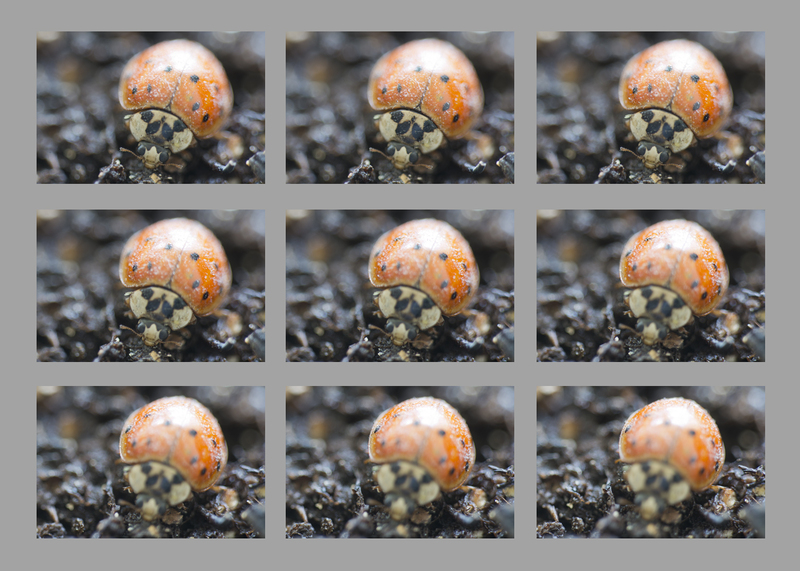 Lady bugs tend to move with some speed and I find the time between shots on the cam ranger very slow for stacking. Would welcome your views. You’re right Victor, I had to try this a couple of times to get it close enough for a stack. But I had just rescued this one from being upside down and unable to right itself so I think it was a bit tired (that’s why there’s so much debris on its back). As soon as it got onto my plant it settled down quite a bit. With the speed of the CamRanger you have to wait for that opportunity while they’ve slowed down. I think I just got lucky. Well I think the advertising is bit misleading, and am a little disappointed as that is what I bought it for. I wonder how fast stackshot is. Sorry to hear that. Have you found it helpful in refining your focusing? I’ve never used Stackshot, or seen it for that matter. I think the real draw for that, at least for me, is the controlled, incremental advancement of the camera without changing the focal length. I have a cheap rail and the advance is loose and not fine enough. Yes but it would not be worthwhile to use it into the field for that. I have a rail. I have a bellows and set up where the subject moves not the camera (but its just completed and I will not be getting to it to test for a few months (lots to do outside). Cam ranger would not work with a manual set up bellows. Zirene stacker is probably my next expenditure.